Merry Christmas to all (or Saturnalia or holiday of your choice) and Trench Hammer is out! I hope all of my wargaming compatriots are enjoying themselves this weekend and will have a good 2018. I have the family and kids here including the new granddaughter and I must say that my life is very, very good. I did clean up for Christmas, here is what the wife got me! Meanwhile, instead of playing out the rest of my AWI campaign, I have been doing dumb stuff like working. But I did have the opportunity of collaborating with Ivan of Nordic Weasel games on an adaptation do Squad Hammer for WW1 tactical games. If you are interested in the period, give it a spin! You can cheaply field a platoon cheaply and quickly in scales from 20mm down to 6mm and play in an hour. You can find it on Wargames Vault here. Here are some Pendraken 10mm Germans I mounted on 40mm x 20mm bases, going to use 2 per squad, but any basing will work. They are supported by a Maxim HMG in a fighting position built out of Sculpey clay. Off to enjoy the rest of the holiday with the family, Merry Christmas! My lovely and talented wife has pitched in to help with the campaign, and she divided the Patriot forces while I divided the British / Loyalists. We used the latest incarnation of my OHW House rules found here. I randomly selected a map from Neil Thomas's One Hour Wargames scenarios and rolled up a river crossing. For narrative purposes, Morgan's plan is not to fight with a river at his back, but to wait on the other side and defeat Tarleton in detail as they crossed. Here Morgan ponders his / her plans. As Tarleton, my plan was based on shock action, I would personally lead my Dragoons across the bridge and disperse the militia, leaving room for the rest of my troops to cross and deploy. I managed to steamroller one militia unit, but the beautiful General Morgan reoriented her forces to contain me and I did not have enough space to bring more troops across. Here we have the Rebels pouring fire into the brave British Legion dragoons while the British Legion foot prepares to cross and support them. The lights fire across the river sporadically. With reports that Tarleton was hor de combat, Major Newmarsh of the 7th foot takes command and calls off the attack. The British fall back and prepare to regroup with Cornwallis' main army. 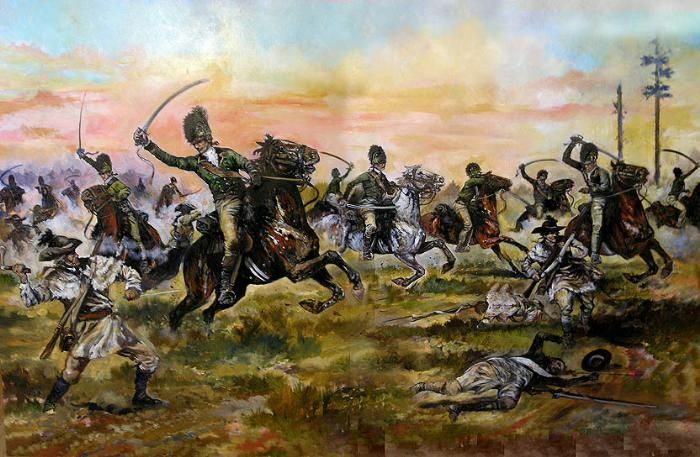 From a campaign standpoint, the British have permanently lost half of the British Legion Dragoons and all of the British Legion foot, as well as Tarleton himself. On the other hand, it was not nearly the disaster of the actual Battle of Cowpens, where Tarleton lost his entire command. From a rules standpoint, we have not played these in a while and it took a little while for both of us to get back up to speed. The next game between the main armies will be an open field battle and should be interesting, with more room to maneuver. As a relative newbie to the wargaming life, I will have to say that I was a bit frustrated with the whole bridge thing. Not only did the bridge limit strategy, but the troop abilities also limited setup choice.Take, for instance, I had 5 units of really lousy militia with a firing capability of two base widths. Great range, but the troop's firepower was limited by 1/2 when compared to everything else on the table. So, I ended up seeing the militia as war fodder as I immediately lost two entire units to the British Calvary. Being a very big poor sport, I got pissy and pulled back all of the "good troops" in my mental attempt to start over again (British set me up). This big baby move actually proved to be a good idea. Having cleared the field a bit, I then moved everything that I felt was "fodder" in direct line with that darn bridge. This included the cannon, which I quickly fell in love with. After a few lucky rolls and some aggressive rallying of the troops (to clear up some hits), the British began a running! Tip #1 Always be clear when asked a question. When asked if my riflemen were safer in the treeline or pulled back, the British cunningly said "Oh yeah! They are untouchable in the treeline." Not true, if you roll a 6. Tip#2 Never set up newbies, or your wife's, men. No need to say more on this. Tip#4 Run through some open field practice games. Tip#5 Keep the newbie focused on using the quick reference sheet. That way the seasoned gamer is a bit less responsible for all the other person's bad die rolls and strategy errors.